Cruise Lines International Association (CLIA) on selling cruising, P&O plans for the future, and we take a look at Cruise and Maritime Voyages (CMV) and Marco Polo. The cruise industry trade organisation CLIA is launching a global campaign called 'ChooseCruise' running throughout this September and October in the UK, aimed at consumers, agents and the media. A number of special promotional events are being held at various towns in the UK and Europe including Manchester and Norwich and two, termed as ‘beach clean’ events, in West Wittering and Formby. CLIA has split the two months into eight weeks, each of which has been given a dedicated theme. Agents will focus on PR, podcast and social media. CLIA will also be producing videos and specially commissioned articles to help to promote cruising. For the UK market, the programme has been neatly divided into a series of sessions: 3-9 September, Relaxation; 10-16, Sports and Fitness; 7-23, Learning and Enrichment; 24-30, Themed Cruises. October is just as varied: 1-7, Food and Drink; 8-14, Family; 5-21, Spa and Wellness; 22-28, Entertainment. Fridays are devoted to River Cruises. The figures for 2018 are a long way off but it does seem that the industry's 2m passenger target will be reached. Once bitten by the cruise bug, adherents tend to come back, gaining new enthusiasts all the time. Britain’s largest cruise operator, P&O, part of the US Carnival Group, together with Cunard and Princess Cruises, is getting ready for the next decade. August 2019 will see the departure from the fleet of the popular Oriana, leaving Arcadia and Aurora as the operator’s Adults-Only ships. 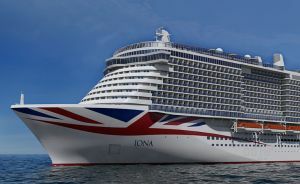 In May 2020, Iona arrives, named after the Scottish island and costing close on $1bn, with a 5,200-passenger capacity. She is under construction at the well-inland Meyer Werft shipyard in Papenburg, Germany. A second similar ship is due to enter service in 2022. She will be the first cruise liner built for the British market to be powered by liquefied natural gas (LNG), which is intended to make her more environmentally friendly than traditional diesel-powered vessels. Whether she follows Britannia and flies the red ensign remains to be seen. Iona will have a three-deck atrium with a grand staircase, 17 eating places including eight specialty restaurants and 12 bars. She will offer 16 whirlpools and four swimming pools, one of which will be part of a glass-covered entertainment venue called SkyDome and features a retractable stage for shows. The ship will also have a half-mile-long lanai deck and a covered promenade with outdoor dining. Booking have opened for Iona’s maiden season of seven-night Norwegian fjords cruises between May and October 2020, featuring scenic cruising opportunities to five fjords. Her sailings include calls to Stavanger, Olden, Geiranger and Bergen, as well as two itineraries including Ålesund. Iona’s maiden cruise on May 14 includes the same mix of destinations, but over nine nights, providing guests with an opportunity to discover this new ship and the stunning fjords scenery. Over the past decade, CMV, now with a fleet of six ships, has built up a fine reputation offering value-for-money cruises for more mature types. It sails from Tilbury, its home port, and also Bristol, Cardiff, Dundee, Harwich, Hull, Liverpool, Newcastle, Poole and Portsmouth, with both short introductory trips and those of a more traditional length. Passengers can also join in Dublin and Cobb (Cork) and there are long winter trips ‘Down Under’ with flights optional for those that want only half the cruise. According to Matthew Swire, hotel director for our cruise on Marco Polo (see also ON TOUR in this issue), 95% of clients are British passport holders with the passenger list including folk from Scotland, Wales plus North America, Australasia and Europe, even a family from China. The operating crew were mainly Russian speakers from the Ukraine, with the service staff mostly Indian, but there were no problems for the most part with language. The CMV fleet is Adults-Only with the exception of a few holiday cruises in August. There were no children on our trip and as the ship was not quite full, it made for an uncluttered vessel easy to get around. 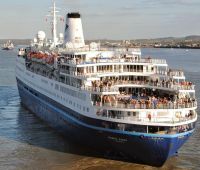 Marco Polo is 22,000 tons, cruises at up to 18 knots and carries 800 passengers and 350 crew. She is certainly not a massive resort ship and is in a niche of her own, friendly and welcoming. Marco Polo is also quite unique as far as cruise ships are concerned. She was built as an ocean liner in 1965 by Mathias-Thesen Werft of East Germany as Aleksandr Pushkin for the Soviet Union's Baltic Shipping Company. After major alterations and additions, she was then renamed for the short-lived (second) Orient Lines, joining her present operator in 2009. She has a strengthened deep hull which makes her ideal for both Arctic and Antarctic cruises, and Denny Brown stabilisers which keep her steady in high seas. While it could be said she is past her sell-by date, she is popular with her passengers, most of whom pre-date the ship. The vessel has been continuously updated and has a generally excellent wi-fi service, although available only in certain areas onboard. This report was produced entirely at sea, and both Skype and Facetime worked fine. A warm welcome starts off a cruise in the right mood. Tilbury has fine motorway access via the M25 and, if luck is with you, entry on the ship can be within ten minutes of arrival at the terminal. There are no long gangways to climb and there is a steward to take you to your cabin and give a short introduction on how everything works. TV, hairdryer and tea/coffee maker are all to hand. There is no fridge/bar, although a room service breakfast is available as is various chargeable hot dishes throughout the day. No self-service washing machines, but a laundry facility. This is not an all-inclusive voyage and there is a £6 daily service charge per passenger. The reasonably-priced ship's tours are also an extra. As with all operators, the fact that the ship waits for passengers on any late official trips is highly promoted. Most of the cabins on Marco Polo are twins (which can be made into doubles), with sizes ranging from 464sq ft to 126sq ft. There are 30 dedicated cabins for single use. Our cabin was a 161sq ft premium ocean view example with a pair of large windows which included a very useful shelf. No balconies but hardly missed. Wardrobe and drawer space were plentiful with the ship built for long transatlantic voyages and whoever sorted out the light switches had actually been on a ship as they were well-positioned. If you do choose this ship, however, bring a variety of plugs – she has never been converted to British square pin. The more-than-adequate private facility has a plastic curtain to the shower and a large lip on entry, typical of the ship on a number of doorways. While wheelchair-bound passengers are welcome, the doorways are manual, unlike the automatic electric ones on more modern ships and once again there is the problem with the lips on the public restrooms. Each cabin has a flat-screen TV with international news and a daily choice of three films. The ship's lectures were not repeated on the tv, which was a pity. Also available from reception is the Britain Today news sheet, eagerly picked up by passengers every morning. 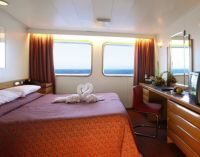 Some of the small number of superior cabins and suites have a bath, fridge and various other amenities. They all get booked early. The clever use of mirrors througout the ship makes it seem spacious. The heart of the ship is the Magellan Deck with show lounge, various bars, shops and the informal bistro. There are plenty of bars too. One down was Pacific Deck and our cabin, and below that the Waldorf Restaurant with sittings at 17:45 and 20:00 and free seating for breakfast and lunch. It never seemed busy and the service was always quick and efficient. We never used the lift. There is no casino. The Russians more or less got it right, with a walk-around promenade deck and a stern layout that cannot be bettered, three floors cascading down to a pool area. It makes for a lovely sun trap in the early evening when steaming in a general easterly direction. The lowest area is the ship's bistro for informal dining and outdoor grill and bar, one up an open deck, with on top three hot tubs. Even higher is a helicopter pad. Indoors over the stern is a spa and well-equipped gym which never seemed to get busy plus male and female saunas. Take your own headset to watch TV/radio as you perform on the keep fit equipment. Dining is an important part of any cruise and Marco Polo offers five-course meals with plenty of choices with gluten-free and vegan available and special requirements pre-booked. You cannot liken with, say, Crystal at the price, but a comparison can be made with local restaurants as found in the average high street. Also on offer was CMV’s Chef's Table, an eight-course extravaganza with paired wine taken in a private room (£49). A journey into Indian gastronomy is also offered by chef Michael Shafi, this time just three courses, also in a private room with a turbaned waiter. At your table you can take Surf and Turf (£16) or Maine lobster (£14). Drinks are reasonably priced, with cocktail of the day at £3.50 and draught beers from £2.30. Wines are from £15. There are officially three formal nights on this cruise, with the rest more relaxed but with no shorts allowed in the Waldorf Restaurant at any time. The busiest person on Marco Polo, as with all cruise ships, was the entertainment director, Mitch Rutter. He was responsible for keeping the passengers entertained from dawn to past midnight, managing among other things a 15-strong song-and-dance team, the ship's band and individual artists performing in the show lounge and other public areas. The entertainment director also keeps an eye on the various lecturers and hosts, individually offering their skills on a whole range of diverse activities including knitting and arts and crafts. Talk subjects included the Artic convoys, the life of Joseph Stalin and the geography of northern Norway. If it was early-morning exercises you wanted, that was a self-imposed task – no Australian keep-fit experts on this trip, although one of the dance team offered daily sessions. Other entertainers kept the ever popular quizzes and other activities going on sea days. Mitch somehow managed the impossible and performed himself. We are still at sea as this report is written. Still to come is the CMV chocolate extravaganza, the ship's crew show and the captain’s final party. And then quickly off at Tilbury. If you have not cruised before, or want a deep-sea trip perhaps to places you have not been, Marco Polo and CMV offer a perfectly acceptable package at competitive prices. On Sunday 9 December, the ship departs Tilbury for a three-night Christmas market voyage across the English Channel and the Seine, visiting Rouen and Honfleur. There is no better way to get in the mood for the holiday season and test the product out. See also ON TOUR in this issue. Marco Polo offers great value and feels and looks like a real ship. I sailed in her as the Marco Polo twice - in the Indian Ocean and along the West Coast of South America under previous owners, and as the Soviet Alexandr Pushkin. She has wonderful outdoor decks and a hot tub high up overlooking the wake. May she sail on forever.